The Kids Are Not All Right: The Political 1978 Spanish Horror Film, “Who Can Kill A Child?” – LILY & GENEROSO 4EVER! 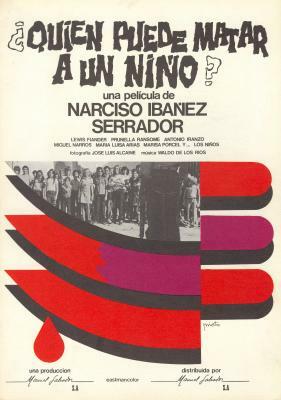 The politics of “Quién puede matar a un niño?” (“Who Can Kill A Child” released in the US as “Island of the Damned) director Narciso Ibáñez Serrador become very clear only five minutes into the film; a heavy handed montage of real atrocities against children from World War Two to Vietnam to the famine in 1970s Central Africa that sets up the premise of this flawed but unique horror film. Based on ideas from the then unwritten novel, “El juego de los niños” (Juvenile Game) by science fiction writer, Juan José Plans, “Who Can Kill A Child” follows the tradition of many zombie films in that it has a group of infected humans who begin to exhibit some traits of murderous behavior. It also draws from the tradition of the haunted house film but uses an island as its particular chamber of horrors. But what truly separates this film from its predecessors in those genres is that its subjects and its choice of scenery appear more normal than one could imagine before everything invariably turns to hell. Expertly shot by a young José Luis Alcaine, who would become the cinematographer of choice for Pedro Almodovar and Bigas Luna, this film has the visual aesthetics of an idyllic day trip to a Spanish resort island where everything appears, but firmly places the idea in the mind of the viewer, that the eventual dystopia could happen anywhere. The unique horror that eventually ensues in the Serrador film comes from contrast of the innocence and beauty that is evident in the children’s faces and their picturesque town against the vile actions that the children mob performs. Almost all of the violence, with the exception of one notable scene, occurs during the day, which jolts the viewer differently than most horror films do in that genre because you normally cringe as you wait for the fall of darkness, which despite building some tension also prepares you for the eventual shock as opposed to here where the horror can come at any moment. Our protagonists, Tom and Evelyn are chased through the town during broad daylight by a horde of blood-thirsty Brady Bunch looking maniacs, but through the use of close-ups that show their playful indifference, the horror really hits home. And in a truly brilliant turn, you even begin to fear the one child you do not see, the one that is growing inside of Evelyn. The key to this film is that once Tom finds a gun, the question arises; Even if warranted, “could you kill these adorable children if you could see their faces?” or “is wartime death of children a necessity that people have gotten used to after thousands of years of war and famine?” These are the political questions that Serrador presents to the viewer, and he does so pretentiously but is very successful by utilizing the genre of horror to carry this message. Serrador later stated that if he had to make this film over again, he would’ve put the documentary montage at the end instead of the beginning, so that the violence that the children exact on Tom and Evelyn would almost seem justified after thousands of years of violence that adults have reaped on children. Again a heavy handed way to end a film, but given that this was made just two years after the death of Franco, it would mark the beginning of many Spanish films that would ask similarly hard questions about the true casualties of war.